Finally – after waiting 6 months for a haul out to get some top secret stuff installed on our test boat – we wanted to do another test at the same time. As we are changing propellers from 3/3 bladed to 4/3 bladed Mercruiser propellers – we thought no better time than the present to do a 1:1 competition between two of the top contenders for propeller anti fouling – PropSpeed and PropGold. As we in the UAE have more or less have the harshest brackish water conditions anywhere on the globe – the test is important. Just a little fouling on your propeller and top speed drops by 25% – and fuel consumption rockets! The new 2 sets of propellers (4 propellers – 2 for each stern drive) was delivered to Drax Marine in Dubai who took care of the coating. Drax has lots of experience with PropSpeed and thought it would be fun to check PropGold the latests arrival. Adam Reeve, the Managing Director of Drax Marine, was kind enough to let his team of specialised boat painters learn all about PropGold to the level they know PropSpeed. And then apply both products to the best of their abilities. So now we have 2 sets of propellers coated and the boat has been hauled. During the next few days the annual service will be done and once the boat launches again – it will be with the new 4/3 propeller sets with brand new coatings on them. 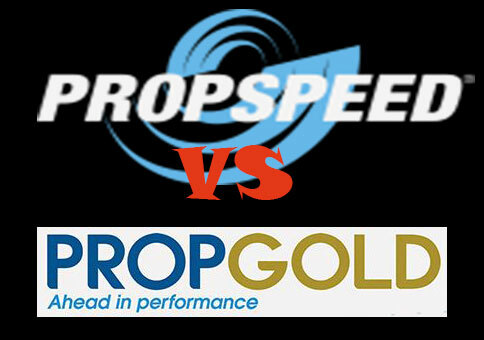 And despite Drax having much more experience with PropSpeed – PropGold is now in the lead with ease of application as per their workshop experience. Hi There, I am very interested in knowing who came out as the winner in this test? Can you direct me to the final post? well – no clear winner – but that also means no clear looser 🙂 I would say they are both great – but like everything – they need motion to stay clear. So if you use your boat on a regular basis – they both work well. But if not Prop Gold had a slight advantage – but not 100% certain if it was angle to the sun that changed things. I did move boat around to combat it but maybe not enough. But both products are good – and reasonably easy to apply. But apply them by the book!